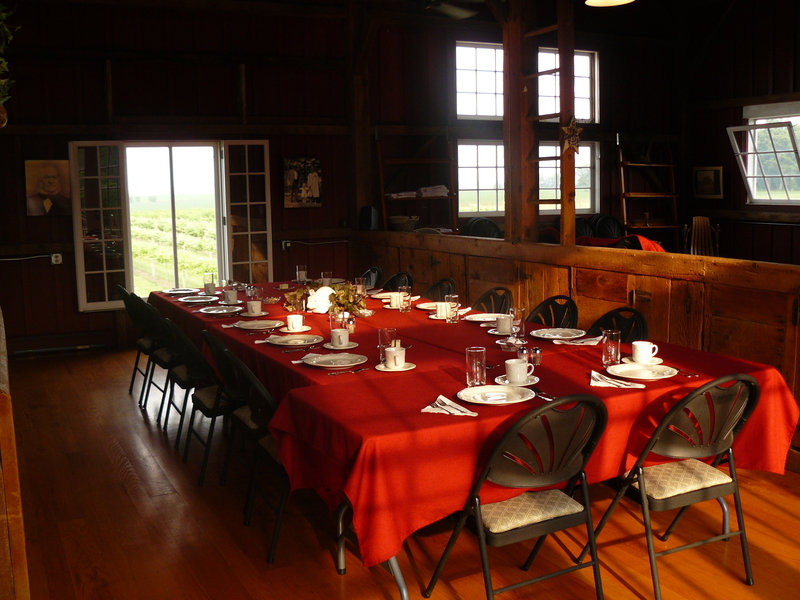 A couple of Saturday nights ago, 12 friends joined me and John for dinner and McEachran Homestead. We arrived within a few minutes of each other, despite coming from all directions. The late afternoon air was humid, but breezy and bright. Finally, a gorgeous day on a farm! I have said it before and I will say it again: McEachran Homestead is the most meticulously maintained farm I have ever seen. It’s perfection. All the lawn, gardens, barns, trimmed and painted and washed; a little paradise dropped into a few hundred acres of rich, black soil. I can only imagine the work that goes into it. First on the agenda was a picture of the girls, minus Ute (she was camera-shy that day) and Sarah. 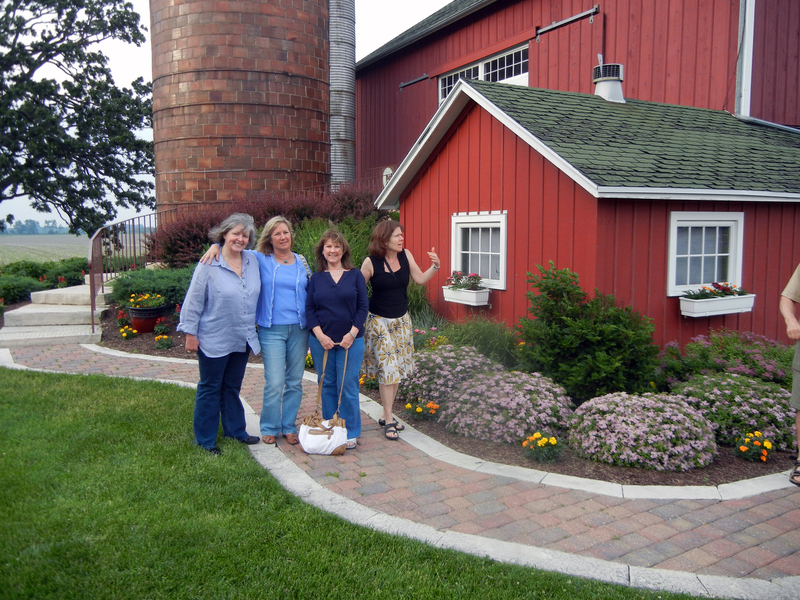 That’s Laura, Mary the Mental Farmer, Kathryn, and Sue. 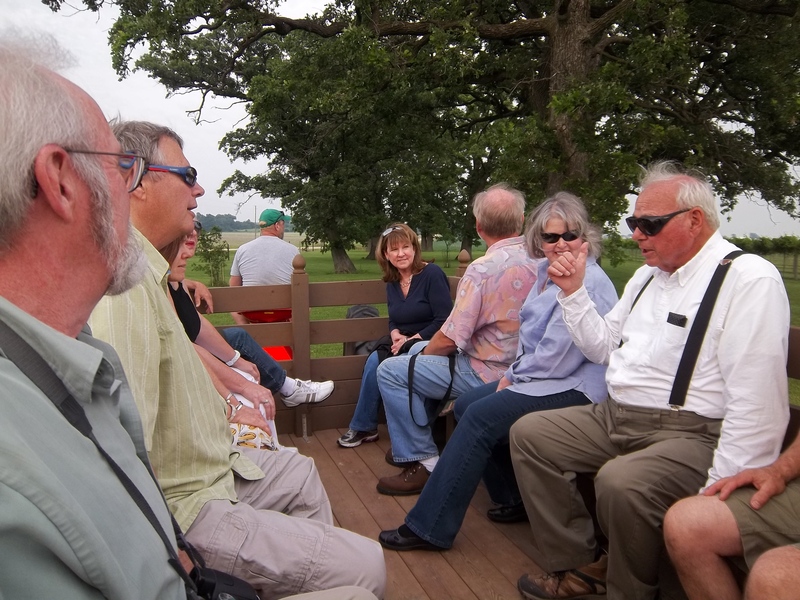 Second, a wagon ride around the farm. The “wagon” is pretty fancy for having that name. 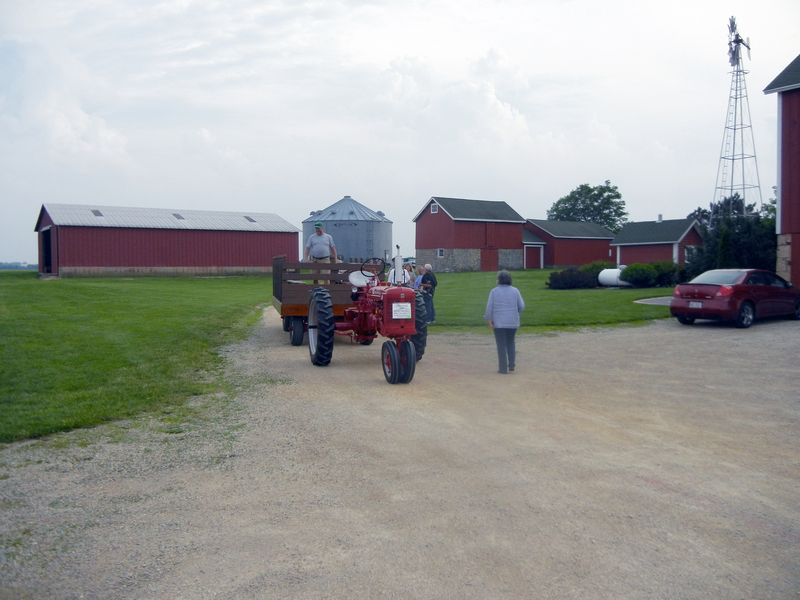 Doctor Greenlee was our official greeter and his son Ken drove the tractor that pulled the wagon. They have a step stool for climbing in. A bench ran the length of each side of the wagon; cushions protected our butts as we bumped gently along. The wagon seated 14 adults with a little elbow room to spare. 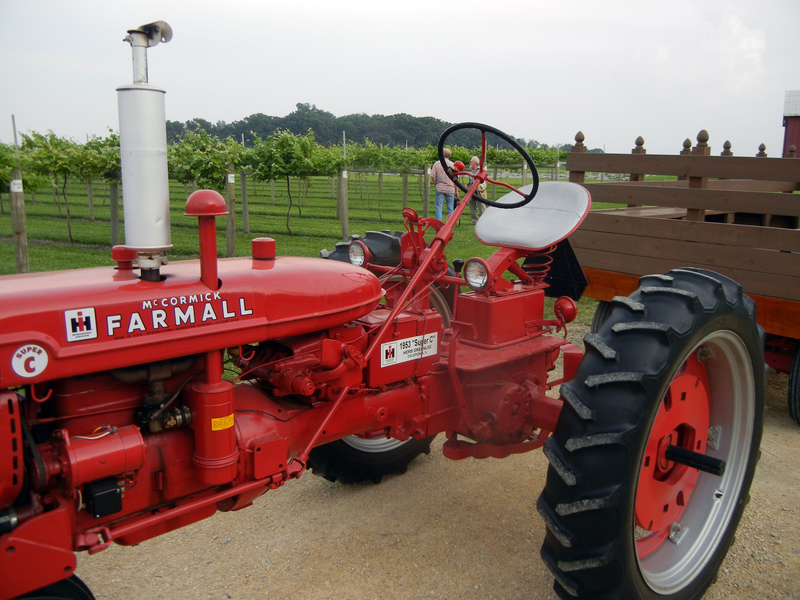 (Our friend Jim offered on several occasions to drive the tractor, but Doc figured out pretty quickly that Jim is a City Boy and declined the offer.) On board were me and John, John’s sister Kathryn and her husband Phil; and our friends: Jim and Laura, Larry and Marcia, Ute and Sam, Sue and Steve. That’s Dr. Greenlee in the white shirt and suspenders. To his left are Laura, Sam, and Kathryn. My hubby John is in the left foreground, and Jim is right beyond him. Our other friends, Sarah and Ron, arrived a bit later. We started by passing the length of the vineyard. Nineteen varieties of grapes on a couple of acres. It was surprising to learn that ten thousand pounds of grapes are harvested from this one field! These grapes make the wine served in the tasting room and at the dinners in the barn. Jim asked if there were barefoot girls stomping grapes, and Doctor Greenlee said seven women worked on the farm but there was no grape stomping. He said he was told what to do when, and they ran his life and bossed him around. He said he was “put upon” and he looked pretty happy about it if you ask me. Doctor Greenlee told us about the history of the farm as the evening progressed, and one of my favorite stories was how his Grandmother had the foresight to save a 5 acre wood lot about a quarter-mile from the house. Dr. Greenlee said after the war he wanted to raze the wood lot and plant more corn, since prices were high and there was money to be made. Grandma forbade it, bless her heart. It is a little fairyland in the middle of a working farm, populated by giant, 200-year-old Burr Oaks, shade loving hostas and native plants. In the middle there is a fire pit. The air was soft and the shadows deepening and it felt enchanted in the wood. We road through and turned back toward the barn and went along the backside of the vineyard land, between the grapes and what I call a kitchen garden. Lettuces, herbs, asparagus, peas and such. Along behind the house, past the original barn, surprisingly small. Life was lived on a smaller scale a hundred and sixty years ago. 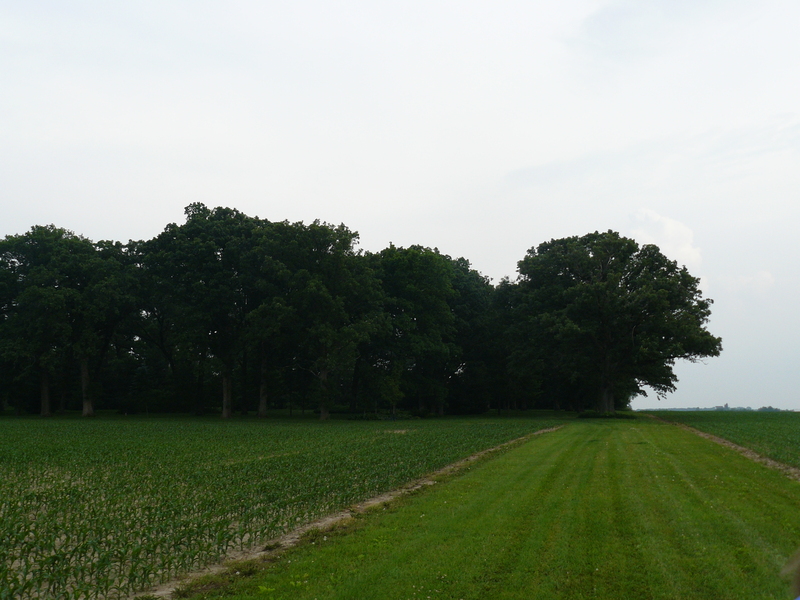 We passed a corn field, the spring raspberries, the fall raspberries, an unplanted tomato field. 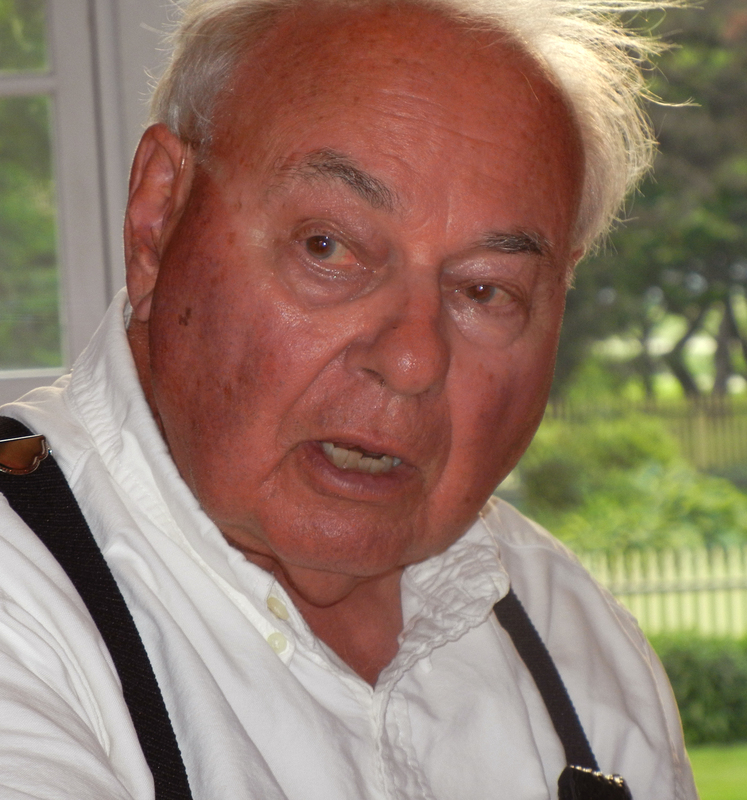 Dr. Greenlee said the women told him their was too much to do with cooking and grapes to plant tomatoes this year. He said this a little wistfully. 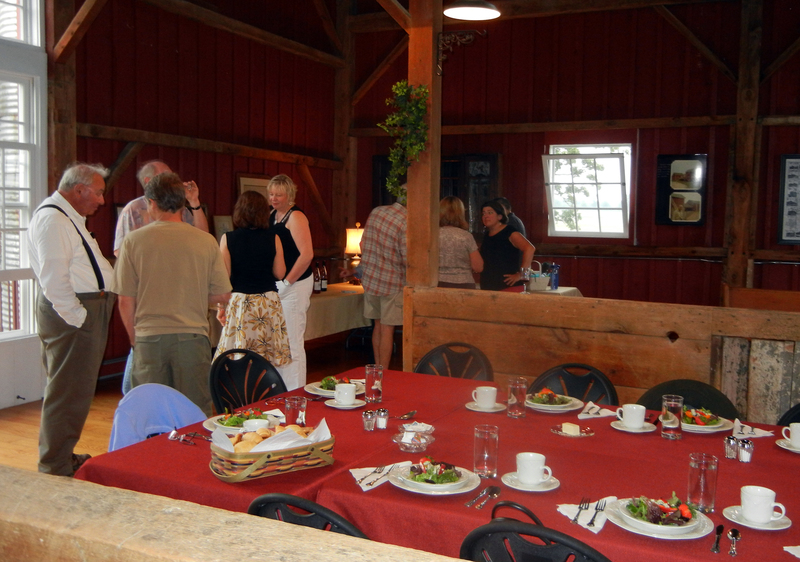 We heard a few mores stories as we rocked along and came back to the barn/winery/commercial kitchen. We dismounted the wagon and headed in for a wine tasting. 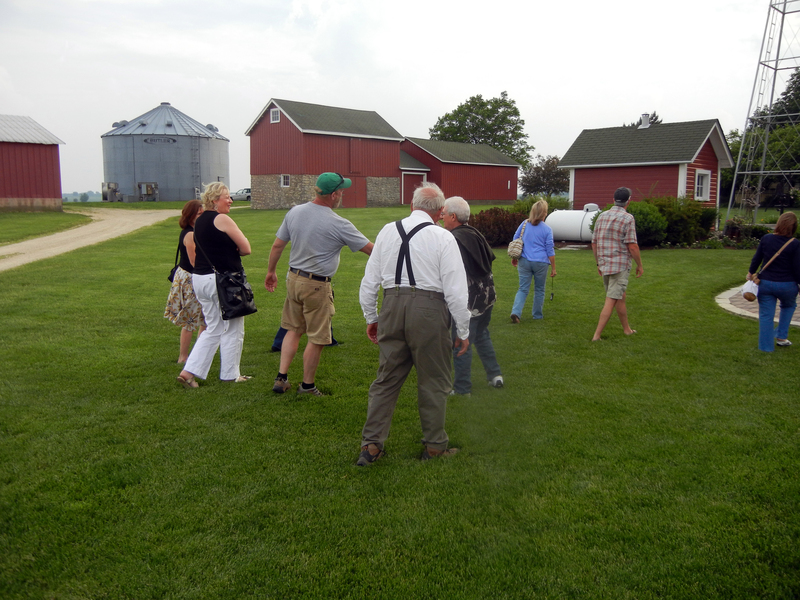 The barn has a lower entrance, but the neat sidewalk around and up to the top is so pretty, it’s the only way to go. We had time to chat and take pictures before we went up into the barn. The tiled silo anchors stone steps, and we entered the barn through 8 foot tall French doors. The dining room is warm and bright. It’s the old haymow. The wood is gorgeous, great old beams. And again, the place is spotless and fresh looking. 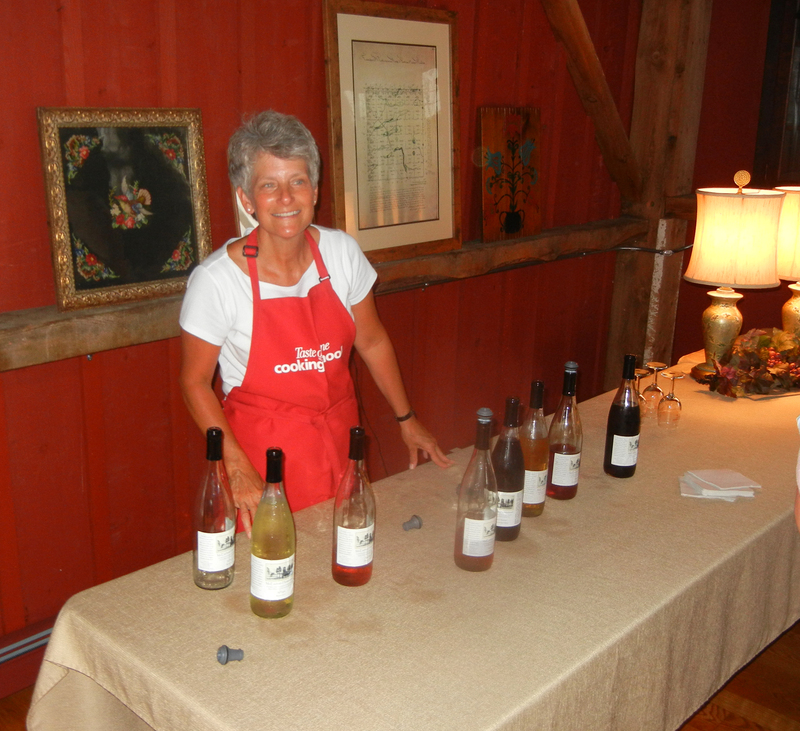 Debbie greeted us there and she poured our wine for us. All varieties of wine were available, most of which I wrote about in an earlier article. (It was from early May, if you want to read the descriptions of the wines.) The wines are a little sweeter than I and my crowd usually drink, but we all tasted everything, enjoyed finding the fruits and minerals in them, and found a choice for dinner. I told Dr. Greenlee that I had heard a story about his grandmother at another farm I visited. She was born on Wind Ridge Herb Farm (home of the poison garden) and apparently snuck out into the fields at night to meet a McEachran as a young girl… and so they were married. He confirmed the rumor, with a twinkle in his eye. I am tempted to tell you about a perilous escape from Scotland on a dark and stormy night… but I think you should go on out there and hear it yourself. It’s a great story and I love that a family has a nearly 200 year old tale to tell. While we were tasting and listening and laughing, the table was set, and beautiful salads appeared! 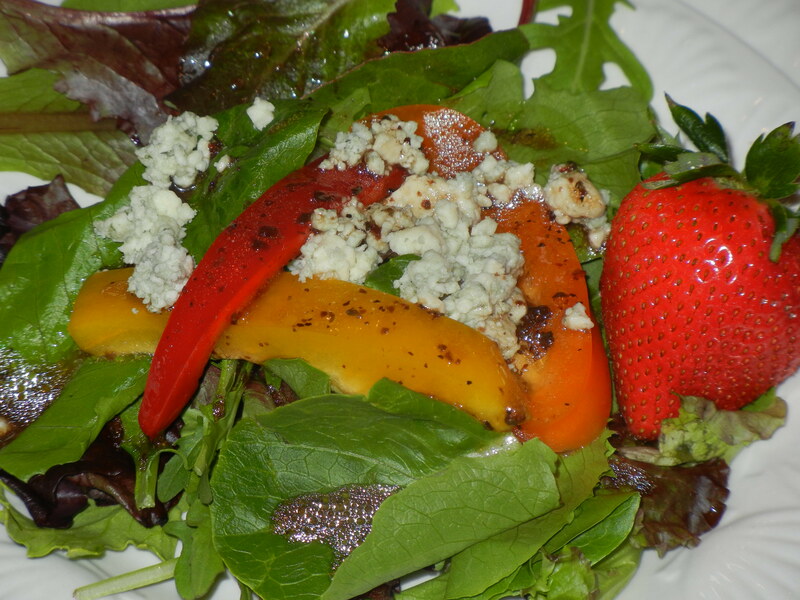 Baby lettuces, strips of sweet peppers, fat strawberries, soft feta cheese, all lightly tossed in a fine balsamic vinegar dressing. We got settled in and began to nibble our salads. Unanimously, we agreed dinner would be fabulous if the salads were any indication. 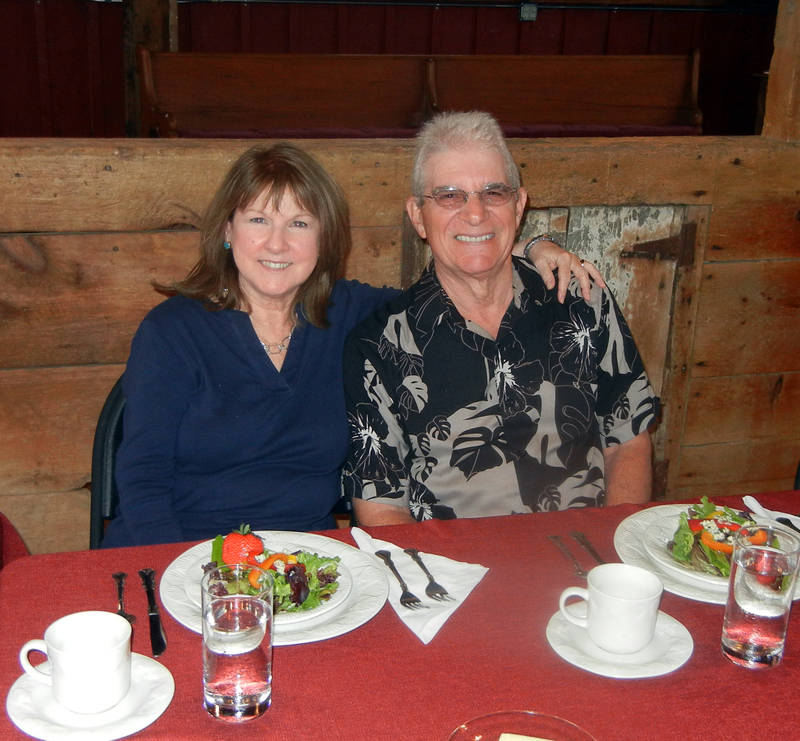 Kathryn said she had never heard Phil rave about a salad, but he did that night, and he sure looks happy in this picture! Salads came and went, glasses refilled, and then came a parade of bowls and platters, served family style. Pork roasts, baked chicken, garlic mashed potatos, fresh farm asparagus. The pork roast had a light au jus, the potatos were thick and buttery. It got quiet for a while as we all got down to business! That chicken was some of the best I have ever eaten. Dessert came in the form of coffee and cream and homemade rhubarb cake with vanilla ice cream. I could have eaten about 4 servings. Fortunately, four were not put before me. I’ll be honest, I was feeling happy and sluggish at this point. We stayed and talked for a while, then went down into the tasting room/shop to make our purchases. St. Pepin was the wine of choice, although we bought the last of it, I think. (Don’t worry, they will work their Homestead magic and make more…) The crew was kind enough to split our checks by couple, so we could make our wine, soap, and lotion purchases on our dinner tabs. My friend Laura and I wanted to stay there and have a fire and camp for the night out in the wood lot. Dr. Greenlee said the woods were full of McEachran ghosts at night, so it wouldn’t be a good idea. This of course appealed to us tremendously. If we had had a couple of sleeping bags, we’d have spent the night out there with the ghosts and fairies. The drive home was mostly tollway and fast at 10:00 on a Saturday night. We all agreed we loved the change of pace; from the usual Saturday night waiting list in the restaurants in town, to the slow roll of a wagon, sweet old stories, beautiful scenery, homemade wine, and a home cooked meal by Tammi. It only takes a party of 6 to have the same experience. And for $35.00 per person, plus wine and gratuity, you can’t beat it. Thank you all, McEachran Homestead team. You made it a special night and we loved every minute of it. I wish I COULD take you along! I think we would find equal joy! I can’t tell you how happy your comment makes me! I just know you will have a lovely wedding and I wish you a long and happy marriage! I hope you will let me know how it goes. When is the big day?